Mohamed Salah’s 25-yard Goal of the Season contender had the whole of Anfield on its feet on Sunday as we soared back to the top of the league with a famous 2-0 win over Chelsea. But it had Xherdan Shaqiri off his feet! 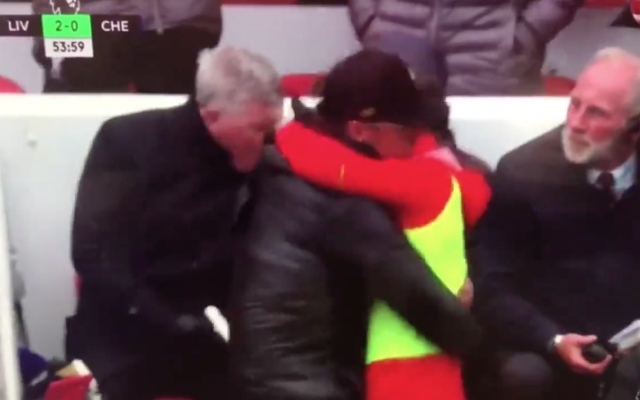 Jürgen Klopp and the diminutive Swiss shared a comical “father and son” moment as the boss celebrated by embracing Big Shaq and lifting him off the floor. It certainly rubbishes rumours that Shaqiri and the German have had a falling out. Shaq has been out of the team because he doesn’t quite fit the 4-3-3 system we’ve been using for the past few months. Shaqiri came on in the 90th minute to replace the irrepressible Salah.